I'm in Dubai for work this week and my visit here has just happened to coincide with National UAE Day, the Emirates' 39th birthday. The locals have really gotten into the festivities. The recession that hit Dubai in 2008 seems to have somewhat receded. There's still a lot of stalled projects and the economy isn't what it used to be. But people aren't panicking anymore that the whole thing is going to come tumbling down; there's a sense of relief and even optimism. 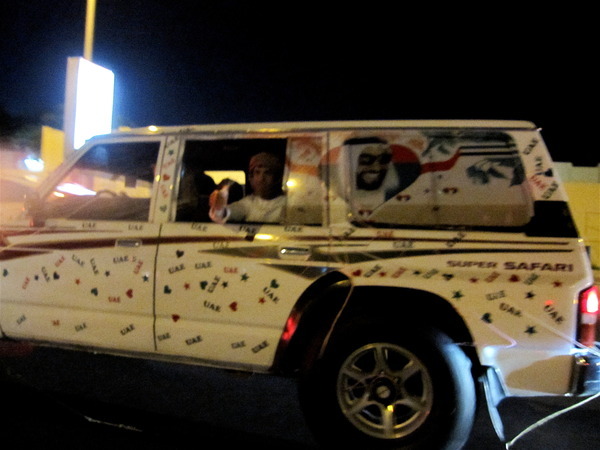 The picture above is of a vehicle decked out for the festivities--someone has been doing great business in applying heart-and-start-burst decorated decals of Sheikh Khalifa, Maktoum and company. Last night, Dubai's main beach-front drag was full of kids in cars like this. The kid leaning out the window of this vehicle is spraying my taxi with silly string. 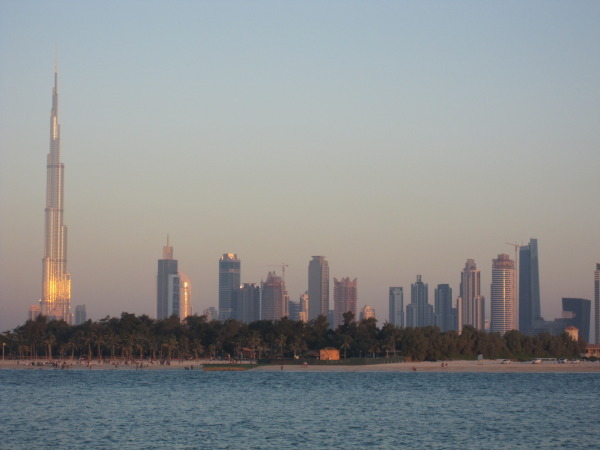 And finally, the Dubai skyline from the water. The impossible and rather stunning building on the left is the Burj Khalifa, the tallest skyscraper in the world. Apparently it was quickly renamed Burj Khalifa after Sheikh Khalifa of Abu Dhabi gave Dubai a $10 billion bail-out. Someone at dinner last night told me it cost $30 million just to change all the shop and street signs on which the original name (Burj Dubai) had already been put.